Say goodbye to waiting for your oats to cook in the morning! 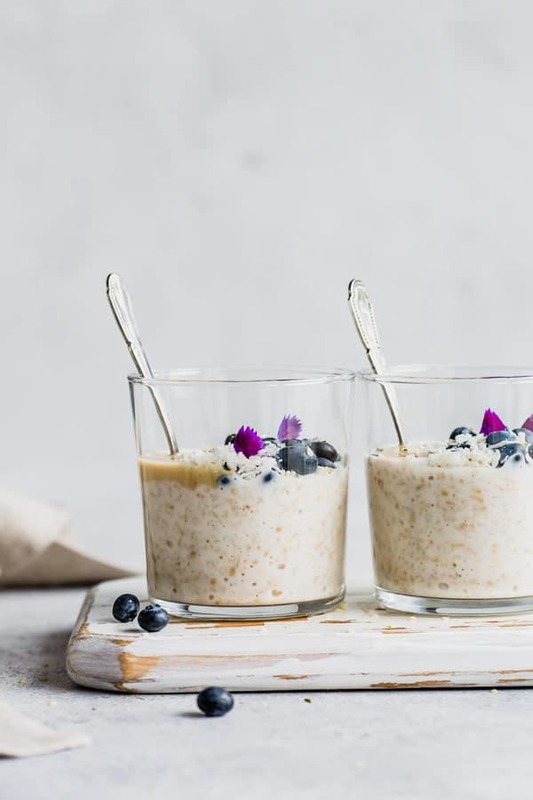 These overnight steel cut oats will save you time in the morning and make the perfect healthy breakfast! Enjoy these oats at home, or in a jar to take on the go! 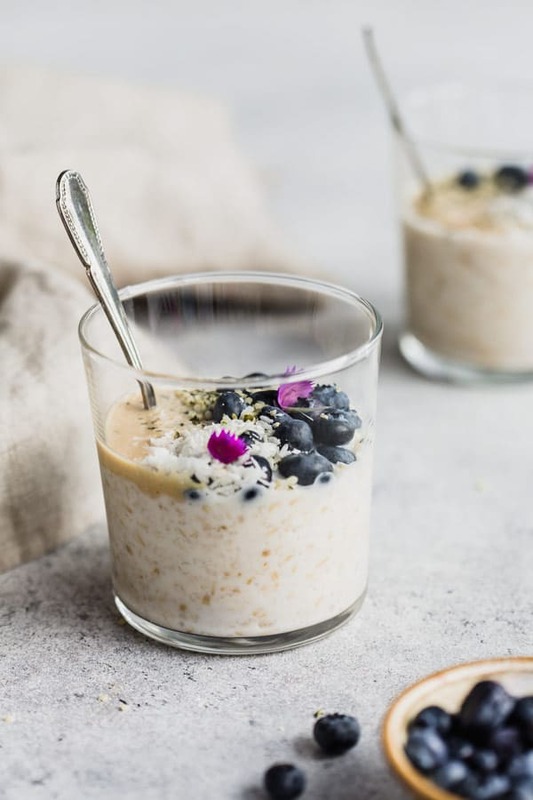 Say hello to your new favourite weekday breakfast – overnight oats! I’ve been an oatmeal breakfast lover for as long as I can remember. But it was only about a year ago that I discovered the amazingness of steel cut oats. 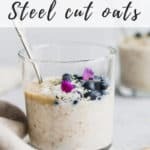 Now if your not familiar with steel cut oats, or are wondering what is the difference between steel cut oats and regular oats, let me break it down for you. The difference all lies in how much the oats have been processed. Quick oats (mostly used for regular oatmeal) are the most processed of the oats, while steel cut oats, are the least processed…they’re essentially just chopped up groats! If you want to please your inner nerd and read more check out quick, rolled and steel cut oats! They have a ton of nutritional benefits and because they’re less processed and have a really amazing chewy texture. The only downside? They take wayyyy longer to cook. But don’t worry, this is where I have good news for you friends! Overnight steel cut oats! ? This is the best steel cut oat recipe. For me, this ratio of oats to liquid produces the creamiest oats out there! These oats sit overnight and do their thing without you having to do anything! Also feel free to add whatever you want! Add some cinnamon or maple syrup to make them a touch sweeter. Add in some fruit for some antioxidant power. 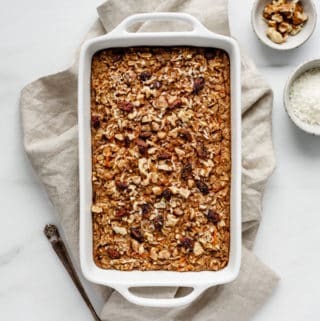 Or put some chia seeds and granola on top for some lovely crunch! This recipe is also great because it is so easy! 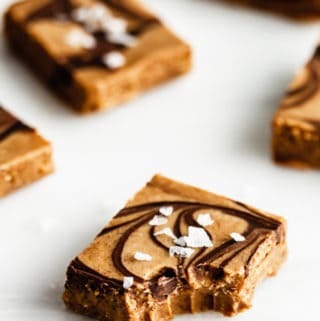 Whip these up in 2 minutes and then enjoy! Say goodbye to not instantly having breakfast waiting for you when you walk in your kitchen! Grab these out of the fridge and you’re set! We’re about to hack the system and have some rich, chewy overnight oats ready to go and waiting to be devoured first thing in the morning! 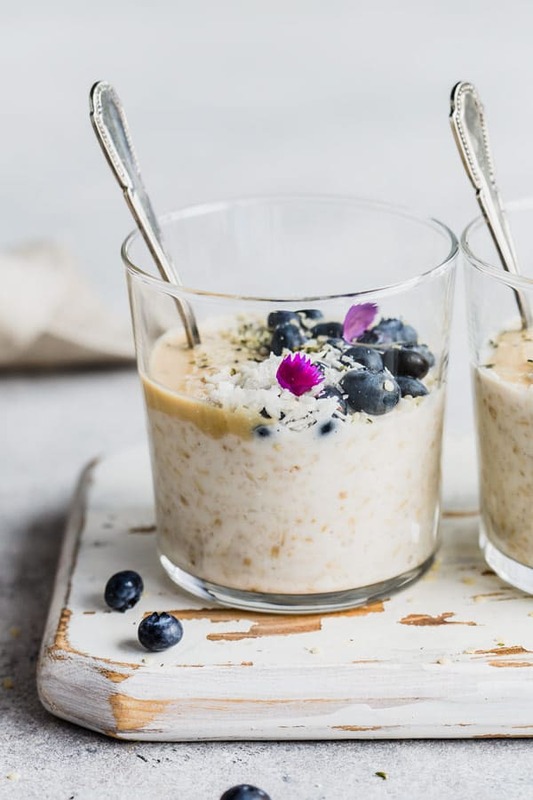 So first things first, this recipe (of course) calls for steel cut oats, and they’re pretty much essential to the recipe-so don’t swap these out for a different kind of oats! The trick to creating extra creamy steel cut overnight oats is by using a mix of water and nut milk. I like to use homemade almond milk but any type of milk will work. 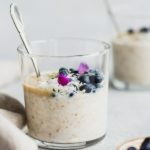 These overnight steel cut oats can be made the traditional way, on the stovetop, or you can also make them in a slow cooker or Instant Pot! If making this recipe in a slow cooker, add an extra 1 1/2 cups of water and turn on low heating overnight. Be sure to remember to coat the inside with something nonstick beforehand to ensure you aren’t spending all morning scrubbing! 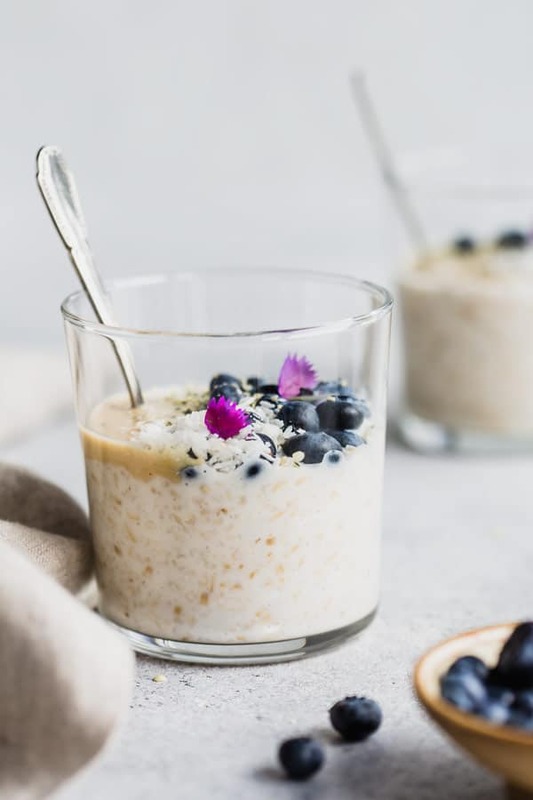 If you are making them in the Instant Pot, combine 1 cup of oats with 1 1/2 cups of water and 1 1/2 cups of almond milk. Cook them quickly with pressure for about 4 minutes, then remove the pressure and allow them to continue cooking on manual for another 20 minutes. I let mine sit for a while because they start to thicken up as they sit! Goodbye waiting for breakfast and hello glorious morning oats! These oats are SO quick and easy to throw together and will save you tons of time in the morning! Add the water and almond to a small pot and bring to a boil. Add the oats, salt, cinnamon and maple syrup, reducing heat to medium and stirring for 2-3 minutes. Turn off the heat and cover the pot with the lid. Let sit on your stovetop or in the fridge overnight. In the morning enjoy the oats as they are or heat them up! Add a splash of almond milk to the oats in the morning if they’re too thick. Transfer the oats to mason jars in the morning for the perfect breakfast on the go. Power up your oats by adding chia seeds, hemp seeds or flax seeds to them! Thanks so much Ela! I love overnight oats but being able to make STEEL CUT overnight oats has definitely become a game changer! 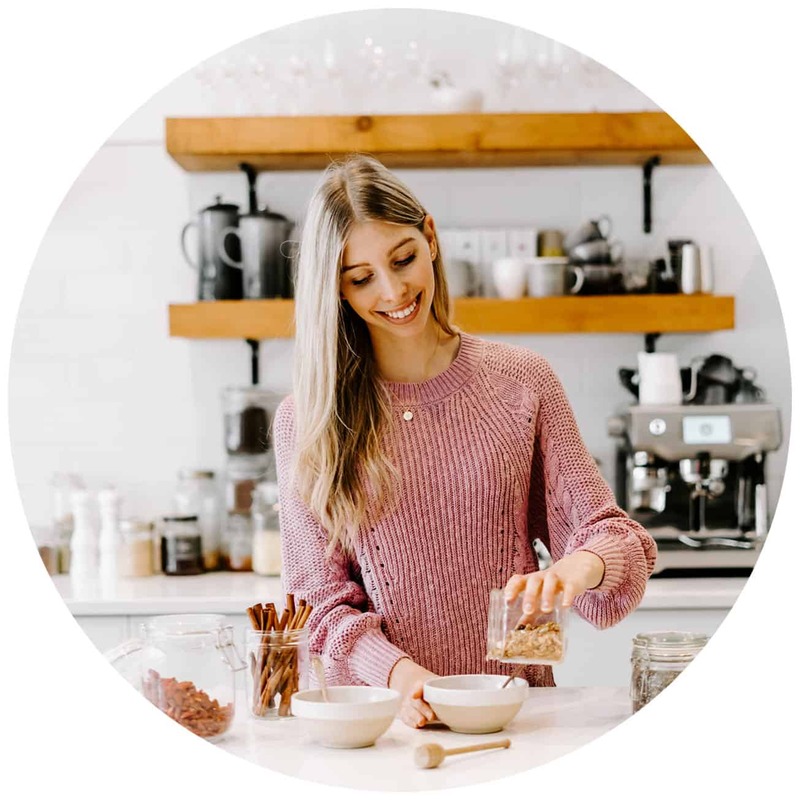 When should you add in the option of (chia, hemp or flax) to the oatmeal mix??? After cooking to sit overnight, or in the morning before serving?? Thank you for following through. Your photos are beautiful shots for this recipe!! Hi Deidre, I would add in chia seeds or flax seeds at the start of the recipe before cooking the oat. 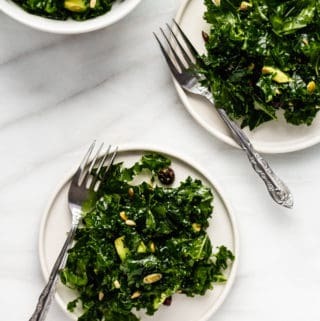 Hemp seeds can be added before or at the end!If you’re adding chia seed I’d go for about 1 tbsp and then add an extra 1/4 cup of liquid as well since chia seeds are very absorbent. And thank you so much!I hope you enjoy the recipe! Yummmmmmy. This is so easy and delicious! I love it! Can you please tell me for how long they can stay in fridge to taste the same? I use unsweetened because I prefer it, but if you like sweetened almond milk you can use that too! So easy and have breakfast ready in the morning! Make this with my girlfriend so we have breakfast ready to go for work!